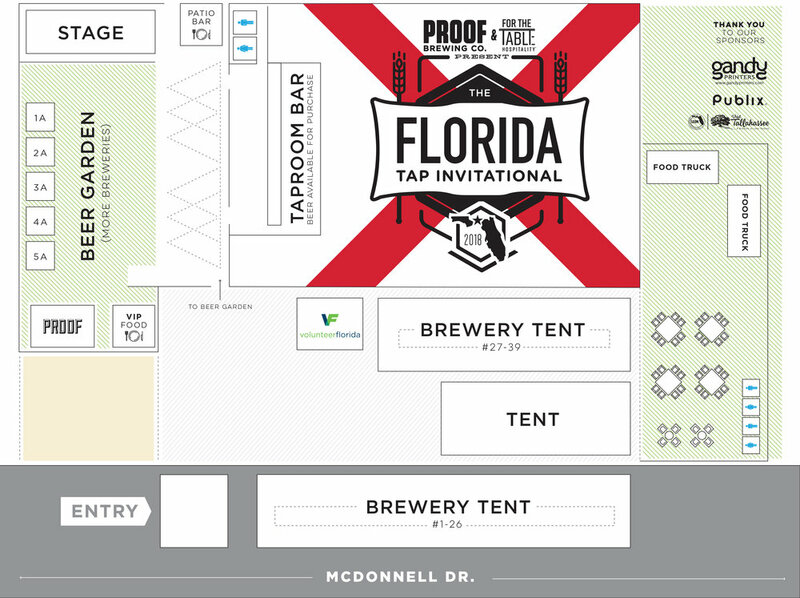 Florida Tap Invitational — Proof Brewing Co. The Florida Tap Invitational is a two-day beer festival in Tallahassee, Florida showcasing craft breweries from throughout the state. 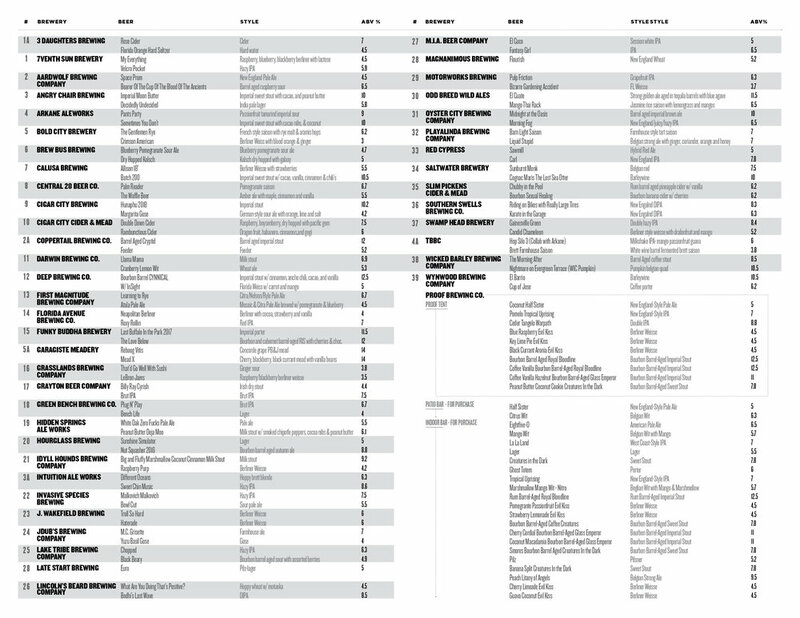 Over 40 breweries pour over 100 limited and specialty beer. Our neighbors in the Florida panhandle were hit hard by Hurricane Michael. To help with relief efforts, a portion of the proceeds from Florida Tap Invitational 2018 ticket sales will be donated to Volunteer Florida and the Florida Disaster Fund. Volunteer Florida is the state’s lead agency for volunteers and donations before, during, and after disasters. We will be collecting hurricane relief supplies for our neighbors in need at the festival on Saturday November 3rd. Please see the FAQs section below for the list of supplies needed. The 6th Annual Florida Tap Invitational 2018 is presented by Proof Brewing Company & For The Table Hospitality and sponsored by Visit Tallahassee. With over 40 amazing Florida craft breweries and over 100 new and rare beers, this two day event is one of North Florida's largest beer festivals. 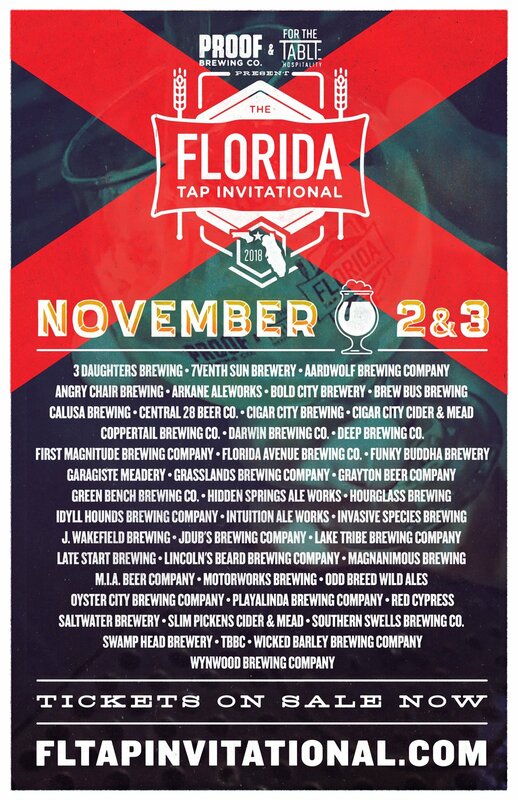 At the FL Tap Invitational you will find exclusively Florida breweries in attendance pouring their finest brews. The beers at the festival include limited release, one-offs, and specialty brews. It's an amazing experience you don't want to miss. Don't believe us? See what the breweries say! Tickets will only be available online via Eventbrite. Tickets will not be sold at the brewery or anywhere else. All festival attendees must be 21 years or older and must arrive with valid ID. NOTICE: All bags are subject to search prior to entry to the festival. Beers included with festival ticket. *Draft list subject to change. The following hotels are downtown and within 2 miles of Proof Brewing Company. How much do advance tickets cost? How much will tickets cost at the door? General Admission will be $65 for cash, $65 plus fees for credit card. No VIP tickets will be sold at the door. What are the hours for the weekend? Friday (In College Town): 6pm – 10pm (General Admission & VIP). Saturday (At Proof Brewing Co): General Admission – 1pm – 4pm. VIP – 12pm – 4pm. Where can you purchase tickets? You can purchase tickets online via Eventbrite, by clicking here. The Florida Tap Invitational is rain or shine. There will be a list of beers each brewery is bringing shared on our social media outlets in the weeks leading up to the festival. What’s included with my General Admission ticket? Access to Friday night kick off party in College Town— at Township, Madison Social and Centrale. Saturday’s beer festival begin at Proof Brewing at 1pm. A commemorative tasting glass is included with unlimited samples until 4pm. What’s included with my VIP ticket? Dinner and beer sampling will be provided by Publix Aprons Event Catering and located in The Gathering (Above Madison Social, entrance will be just East of Madison Social entrance). VIP entrance on Saturday begins at noon for the beer festival at Proof Brewing. A commemorative tasting glass is included with unlimited samples until 4pm. VIP also includes a plate of food that will be available pick up at Pints and Plates by Mobi. A bottle of Royal Bloodline Imperial Stout is also included with the festival ticket. Pick up for the Royal Bloodline bottle will be on Friday from noon – 6pm (at tasting room bar). You can also pick up the bottle on Saturday at the festival or Sunday during business hours. You must bring an ID. I purchased a General Admission ticket— Where do I check in on Friday? Check in is from 6-8pm at Township (Located in College Town). You will start there and then you can walk to the next destination at your leisure. Friday night’s kick-off party ends at 10pm. I purchased a VIP ticket— Where do I check in on Friday? Check in will start at 6pm in The Gathering (Located in College Town, above Madison Social). The entrance is in between Madison Social and Coosh. You will proceed inside the double doors and then take the elevator to The Gathering which is on the 2nd floor. The dinner ends at 10pm. Will there be food available for purchase on Saturday? Yes, we will have food trucks (Pints & Plates by Mobi, Tally Mac Shack, & Crave Food Truck) available on site. I bought a VIP ticket, how will I get my bottle? Pick up for the Royal Bloodline bottle will be on Friday (11/2) from noon – 6pm (at tasting room bar). You can also pick up your bottle on Saturday at the festival or Sunday (noon – midnight). You must bring your ID. You must be 21+ and present a valid ID. No children will be allowed. Where can I park on Friday for the kick-off party or VIP dinner in College Town? As always, we highly recommend Yellow Cab, Uber, or Lyft unless you have a designated driver. If you do drive to College Town there is free parking at the garage and lot on St. Augustine off Woodwood. There is paid parking in the garage off Lorene Street. To use the paid parking, you can pay at the meters located on Madison Street or as you exit the garage. You must have your plate numbers to pay. You can also download the ParkByApp (all one word) and pay. This will also allow you to add additional time if needed through the app. Where can I park on Saturday for the beer festival at Proof Brewing? We encourage all patrons unless they have a designated driver, to get dropped off with Yellow Cab, Uber, or Lyft. If you decide to park, there are limited parking options. There is limited parking available at the entrance of RRSQ in a lot. There is parallel parking along FAMU Way. There is parking in the dirt lot across from Greenwise. All ticket sales are final and no refunds will be allowed. Do I need to print out my ticket to get into the event? You must show your QR code found on the ticket through your smartphone or on a printed ticket. What hurricane relief supplies** are you collecting? Non-perishable food: peanut butter, bread, crackers, granola bars, breakfast bars, pop-top cans of foods for easy opening, etc. Hygiene products: soap, body wash, sanitary items, deodorant, toothpaste, toothbrush, shampoo, conditioner, etc. **When gathering items for donation, please be considerate of the items' quality as they will go to people in need.